From time to time, some wineries talk about reducing the number of wines they produce. It does not seem that is much of a conversation at Mt. Boucherie Family Estate Winery where winemaker Jim Faulkner and his team get to make at last 21 different wines. In fact, there are more “SKU’s” than that because the winery releases some of its wines in three litre boxes. That package does not qualify for the VQA designation but these are VQA quality wines at a very good price. The box of unoaked Chardonnay, at $38.50, works out to $9.63 a bottle. Each year Mt. Boucherie produces around 25,000 cases of wine, all of it estate-grown. 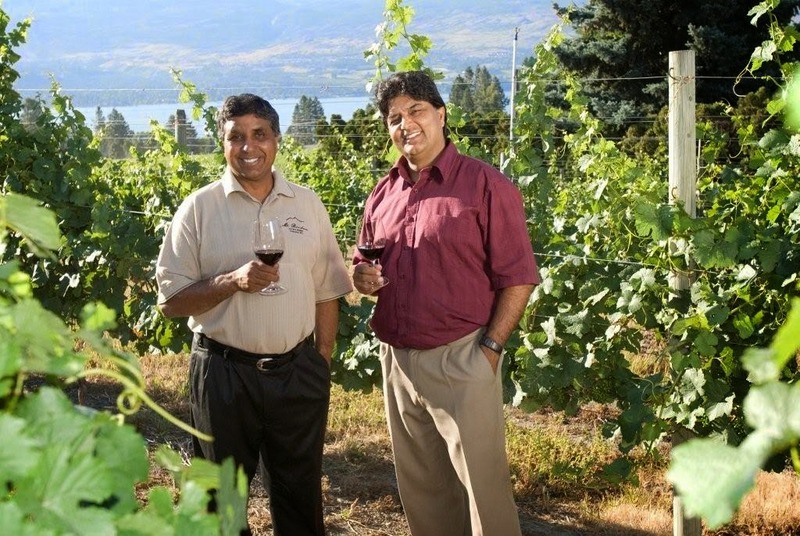 Kal and Nirmal Gidda, who own the winery with their families, have 300 acres of vineyard in three regions: West Kelowna, Okanagan Falls and the Similkameen Valley. This gives the winemaker many options for making varietals and blends. Six examples from the winery’s current releases show the depth of the portfolio and the skill of the growers and the winemaker. Mt. Boucherie Riesling 2012 ($16 for 560 cases). The wine begins with aromas of grapefruit and tangerine with just a faint whiff of petrol (a good thing in Riesling). On the palate, there are flavours of lemon and green apple with a touch of slate on the finish. The balance is exquisite: the residual sugar, which lifts the flavours, is offset by crisp acidity, give the wine a dry finish. 88. Mt. Boucherie Sémillon 2011 ($15.50 for 112 cases). This wine, from grapes grown near Okanagan Falls, reminds me of a Hunter Valley Sémillon. I think it would a worthwhile idea (especially at this price) to set some of this wine aside for five or 10 years, allowing the nascent complexity to develop in bottle, as it does in the Hunter. The wine begins with aromas of lemon and lemon oil, leading to flavours of citrus, honeydew and apple with a silky spine. The finish is dry. 90. Mt. Boucherie Family Reserve Gamay Noir 2012 ($20 for 1,338 cases). The wine begins with aromas of cherry and vanilla. On the palate, there are flavours of cherries and red currants with a good shake of black pepper. This might be a candidate for decanting; as it breathes, the texture become fleshy. 88. Mt. Boucherie Pinot Noir 2011 ($21 for 1,356 cases). The fruit for this wine is from the Gidda family’s vineyards near Cawston. The wine begins with aromas of cherries, leading to flavours of cherry and strawberry with a hint of spice (the winery’s notes say fennel) on the finish. The silky tannins add to the appeal of a very drinkable wine at bargain price for Pinot Noir. It is a versatile wine: served chilled on a hot day, it was quite refreshing. 88. Mt. Boucherie Summit Reserve Syrah 2009 ($25 for 350 cases). The wine begins with heady aromas of black cherry, plum and vanilla. It is generous on the palate, with meaty flavours, mingling plum, prune, liquorice and salami. There is a touch of black pepper on the lingering finish. The wine shows all the ripeness (alcohol of 14.5%) of a great vintage. The wine needs to be decanted because it has begun to throw sediment, as most good reds will. 91. Mt. Boucherie Family Reserve Zinfandel 2010 ($35 for 250 cases). The bold, rustic personality of this wine should appeal to all Zinfandel fans. It begins with peppery aromas of raspberry and blackberry. On the palate, there are flavours of blackberry over an earthy undertone. When this wine is decanted – as it should be – a rich texture emerges with hints of chocolate and liquorice on the finish. 91.